Further to my little tips and tricks for spandex last month I thought I would write a little tutorial on a few other spandex related costume pieces. I’ll be writing the odd tutorial here and there so today I’m going to start off with, what I call, superhero booties. Now, before I get started I’m not going to claim that I developed this method, I actually got taught this by someone else, but it’s a question I’ve received a few times about how I make my spandex booties for characters like Ms Marvel and Psylocke. If you get printed suits, you might also find this useful for fitting shoes into spiderman suits etc. Step 1: Make a giant sock out of the spandex you wish to use. Unfortunately I forgot to take a photo of this particular step but if you fold over the spandex and just sew up one side you can get away with only having one seam in the bootie and it will look smoother in pictures. Once it’s sewn, put it on and cut it to the right length. Put elastic around the top and any details you want to put on. Step 2: Get a pair of cheap shoes you don’t mind cutting up. You have to make sure these are smooth on the top because any bumps will show through. For girls I recommend pumps with a flat heel, for guys plimsoles are good but you might need a bit of extra work cutting off excess shoe sole. If you want your booties to be on high heels, same thing applies, make sure it’s smooth. Once you have these score along the edges of the soles to loosen the glue, if you use plimsoles you might need to cut away the extra sole that surrounds the shoe. 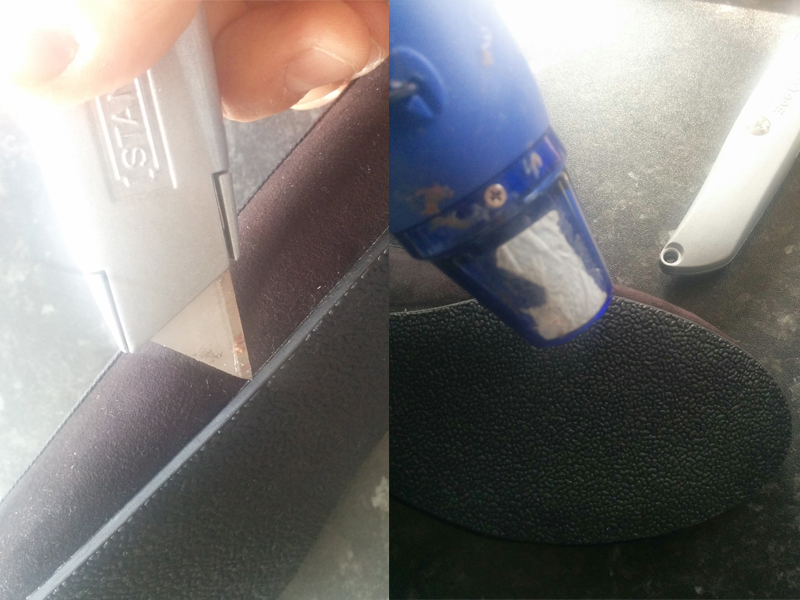 Use a heat gun to heat the sole a little, this helps to melt the glue a little which makes the sole easier to peel away. 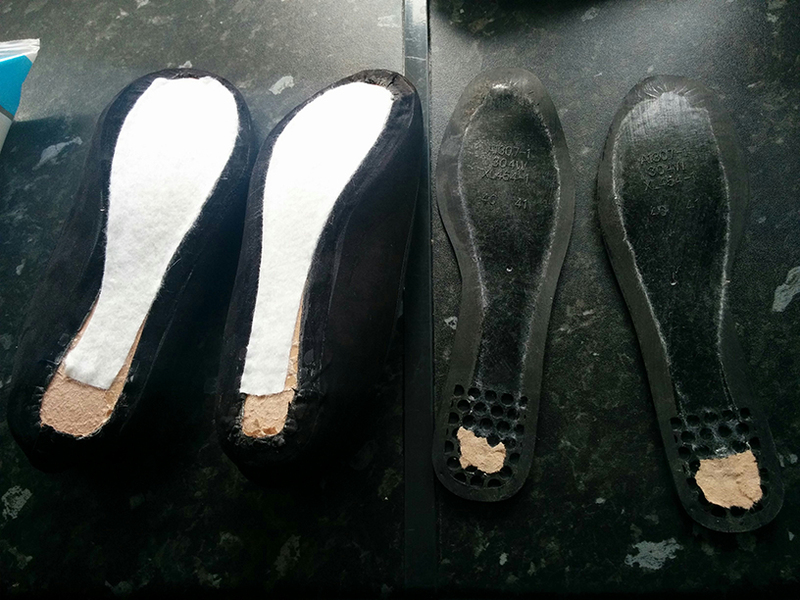 Be careful with the heat gun, make sure it’s on a low heat setting or you’ll melt or deform the shoe sole. Step 3: put the top part of the shoe into the sock (it’s usually easier if you’re wearing the shoe as well) and pull the bootie around it until you are happy with the fit of the spandex around the shoe. The main reason I make sure the whole shoe does in is because it gives the foot a nice shape. I’ve seen loads of suits, usually Spiderman suits, where a shoe hasn’t been inserted into the suit itself and you can see people’s toes through the spandex. 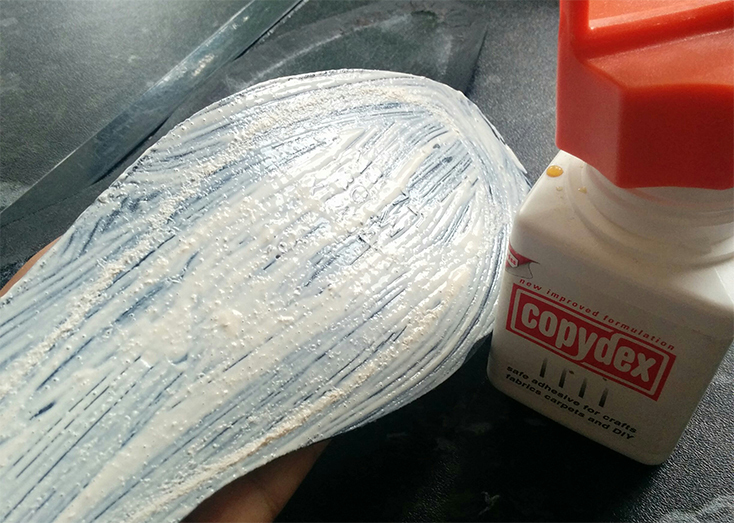 Once you’re happy with the fit of the spandex get the sole and cover it in Copydex. Leave it for a few moments and then line it up with the bottom of the shoe. You will need to hold it in place for a few minutes then put your foot down flat until the glue has dried a bit. For copydex I usually keep my foot pressed to the ground for a good 20 minutes or so otherwise the sole comes away. If there are any edges that have come away from the spandex just stick a bit of contact adhesive (like Impact glue) on it then press it down until it’s set. 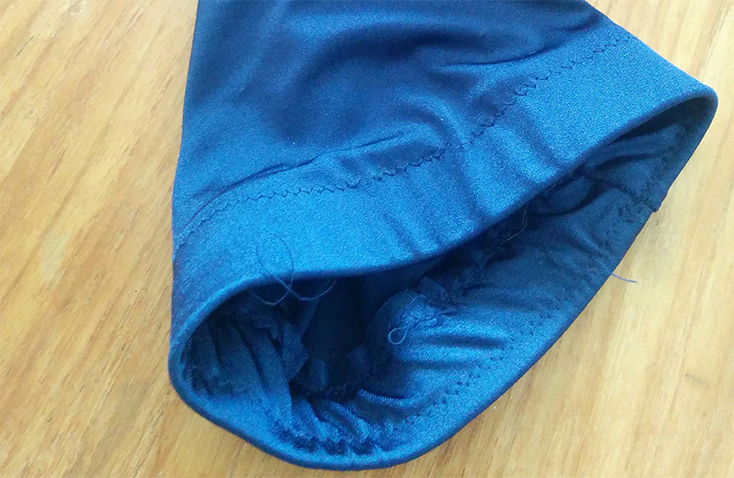 If you are using high heels I have found that if you put a hole in the sock for the heel then use a fresh piece of spandex to cover the heel, you should get a similar effect that is clean. Again use the same method to detach the soles first if you can to get a nice neat look to the bottom of your shoe instead of cutting the spandex. It’s more secure this way and is usually a lot neater. Original image taken by Kurnikoff. Cropped to just show the boots and what the booties should look like once they are done. Regarding the first step, is it essentially taking a big piece of spandex and fitting it around one leg? How much fabric would that take for one sock?